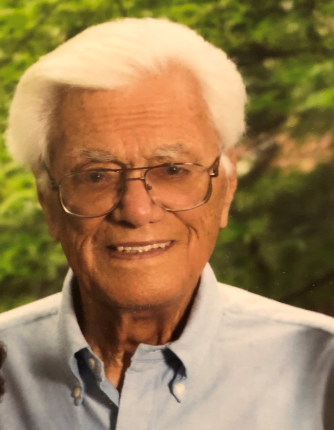 George “Mara” Maravelias, 87, of Needham, passed away peacefully on April 6, 2019 with his family by his side. He is survived by his wife Irene (Marines) Maravelias, daughters Diane Maravelias and Carole Maravelias Buckley, son-in-law Robert Buckley, and three grandchildren Garrett, Sarah, and Lukas. George was born in Lynn, the beloved son of Angelo and Jenny (Spyropolos) Maravelias both of Greece. He had two brothers, James of Danvers, Socrates of Saugus, and three loving sisters Ann of Ayer, Barbara of Andover, and Esther of Santa Barbara, CA. George came from a large family of many cousins, nieces, and nephews. George graduated from Lynn Classical High School, where he excelled in football and basketball. After high school George enlisted in the Army where he bravely served in the Korean War. George was awarded the Purple Heart after being wounded protecting his country. George married the love of his life Irene Marines Maravelias on August 19, 1955 and started his family. George then graduated from Northeastern University in 1960 with his bachelors of science. George worked as an accountant until 1982 when he became the president of Innovative Coatings in Medway. He grew the company over the years with many successes. George moved his family to Needham in 1965 where he spent the next 55 years making memories with many cocktail hours and pool parties. Over the years his neighbors became his extended family and their children, his extended grandchildren. He was known as “The Mayor” of the street. George will leave behind a legacy of many jokes, comical wit, and funny personality. George was always the life of the party making everyone laugh around him. He truly lived larger than life. He enjoyed deep sea fishing, a good cigar, cooking for his friends, being with his family, and above all making people laugh. Despite George’s many accomplishments in life, his proudest job was being a grandfather. George was always an active participant in their lives. He never missed a birthday party, holiday, or sporting event. He was known as “Papa” to everyone in the stands of the lacrosse games. He enjoyed taking his grandchildren on vacations to the ocean where he loved to swim and play in the sand. Above all, he enjoyed cooking for his family for Sunday night dinners. George was loved by everyone and will be missed by all. Visiting hours will be held in the Eaton Funeral Home, 1351 Highland Ave, Needham, on Wednesday, April 10th from 4-7 pm. Relatives and friends are kindly invited to attend. A Funeral Service will be held at St. Demetrios Greek Orthodox Church, 57 Brown St, Weston, on Thursday April 11th at 10am. Interment with Military Honors will follow at Needham Cemetery. The family has requested that in lieu of flowers, memorial donations be made in George’s honor to the Amyloid Research Fund at the Boston University School of Medicine at 72 East Concord Street, K-503 Boston, MA 02118.